A deck-by-deck analysis of the Carnival Glory's best and worst cabins. Looking for the best cabins on the Carnival Glory? Want to find the cabin with a little larger balcony than most? And what about staying away from undesirable cabins on the Carnival Glory? How do you avoid the worst cabins on the Carnival Glory? Help us improve this guide! Have you stayed in a great cabin on the Carnival Glory that we missed? Is there a cabin on the Carnival Glory that you recommend people try to avoid? Let us know! Is there better advice that we can give--we would love to hear from you. Use the form at the bottom of the page to let us know your thoughts. Your input will help other travelers. Cabins to be wary of on the Carnival Glory are staterooms and suites on Decks 2, 6, and 8. Cabins on the Carnival Glory's Deck 1 have cabins above them that buffer noise from public areas. However, it's important to remember that the engine room and the propellers are beneath this deck. 1420- 1452, 1429- 1461, 1426- 1456, and 1435- 1465 on the Carnival Glory are in the aft section of Deck 1. Engine noise and propeller vibration could be concerns in any of these staterooms. Deck 2 is right beneath several major public areas on the Carnival Glory -- the main dining rooms, the ship's galley, and the main lounge. Noise from the areas could be problematic. While it's possible to find a nice cabin on Main Deck, we do not recommend several of these staterooms to light sleepers. Ocean View Staterooms 2216- 2266 port side and 2217- 2267 starboard, and Interior Staterooms 2218- 2268 and 2219- 2269 are beneath the Amber Palace Main Lounge. Noise could be an issue in any of these cabins during rehearsals and performances, and when staff are cleaning. Port side, 2270- 2276 are beneath public bathrooms. Noise -such as hearing water rush through pipes- could be of concern in these Ocean View Staterooms on Deck 2 of the Carnival Glory. Ocean View Staterooms 2278- 2286 port side and 2279- 2287 starboard are beneath relatively quiet areas on the Carnival Glory's Main Deck. Ocean View Staterooms 2288- 2308 port side and 2289- 2309, and Interior Staterooms 2290- 2310 and 2291- 2311 are beneath the Colors Lobby and staff work areas. Noise could be problematic late into the evening in any of these cabins. Ocean View Staterooms 2312- 2320 port side and 2315- 2323 starboard are respectively beneath the Copper Card Room and the Silver Art Gallery. These are fairly quiet public venues, so these Main Deck staterooms should be good choices! Ocean View Staterooms 2324- 2356 port side and 2319- 2359 starboard, and Interior Staterooms 2314- 2350 and 2317- 2353 are beneath the Golden main dining room. Noise when this dining room is open, and when staff are cleaning, could be issues in these cabins. In the aft section of Main Deck on the Carnival Glory, Ocean View Staterooms 2438- 2480 port side and 2441- 2483 starboard, and Interior Staterooms 2444- 2468 and 2447- 2471 are beneath the Platinum main dining room. Along this entire deck, you should be aware that the main drag of the Carnival Glory is right beneath your cabin -- including some areas that stay fairly noisy into the wee hours. This includes the Disco, Casino, Video Arcade, Teen Disco, and the Main and Aft Lounges. Balcony Staterooms 6220- 6260 port side and 6223- 6263 starboard, and Interior Staterooms 6224- 6262 and 6227- 6265 are above the Amber Palace Main Lounge. Noise could be a problem during rehearsals and performances, and when staff are cleaning, in any of these cabins. Balcony Staterooms 6268- 6284 port side and 6271- 6331 starboard are over the Fun Shops. Noise is likely not much on an issue in these cabins, so these would be good choices on Upper Deck of the Carnival Glory. Some of the worst cabins on board the Carnival Glory are on the Upper Deck. While we are not suggesting this deck be completely avoided, light sleepers may prefer to find a cabin elsewhere on the ship, or, bring earplugs or a wave machine (a sound device available at a specialty retailer like Brookstone -- produces pleasant sounds that can wipe out the unpleasant sounds). The Balcony category cabins in the rear of the Carnival Glory (6452-6483) all have over sized balconies and those highly sought after rear facing views. The Empress deck is one of the best decks on the Carnival Glory! With cabin decks above and beneath Deck 7 to buffer noise, it's easy to understand why this deck boasts many of the Carnival Glory's luxury suites. 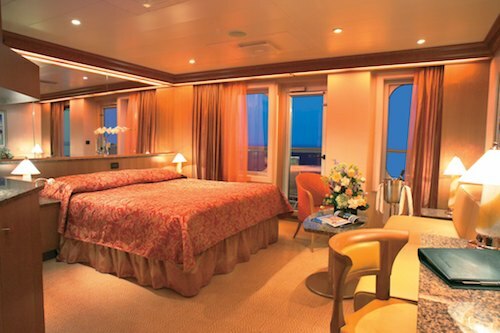 Balcony Staterooms and Interior Staterooms are also available on Empress Deck! There are 40 Category OS Ocean Suites on Empress Deck of the Carnival Glory. These are 7228- 7282 and 7314- 7330 port side and 7231- 7283 and 7317- 7333 starboard. Each offers 275 sq. ft. with a 65 sq. ft. balcony. Verandah Deck cabin on the Carnival Glory are beneath Lido Deck. This means that, with the exception of accommodations in Deck 8's forward section, these cabins are under the pools and the Lido Buffet. Light sleepers are advised to either seek a cabin in the forward section of Verandah Deck, or locate accommodations elsewhere. The rest of the staterooms on the Carnival Glory's Verandah Deck are under public venues and areas from which noise could emanate. These are Balcony Staterooms 8288- 8454 port side and 8289- 8461 starboard, and Interior Staterooms 8290- 8342, 8291- 8345, 8354- 8366, 8357- 8373, 8386- 8414, 8391- 8419, 8424- 8446, and 8431- 8453. The aft Premium Vista Balcony Staterooms on Deck 8 of the Carnival Glory are 8448 and 8455. Each has a 75 sq. ft. balcony and a commanding ocean view. The staterooms and suites on the Carnival Glory's Lido Deck are close to the pool, spa & gym facilities, but most have cabins above and beneath to buffer noise. Deck 9 also boasts the two most luxurious suites available on this ship! Forward on the Lido Deck of the Carnival Glory, 9200 and 9201 are both Scenic Grand Ocean View Staterooms. Each will offer more than the average 320 sq. ft. and have amazing views from large picture windows. Cabins on the Panorama Deck on board the Carnival Glory are close to the pool, and the spa and fitness facilities. Many, but not all, of these staterooms have the added benefit of cabins above and beneath; these accommodations will be fairly quiet. With a bit of careful planning, it is possible to find a very nice cabin for cruising on Deck 10. While there are doors to suppress the sound from the Carnival Glory's pool area, cabins 1062 and1067 are a bit close to the pool area and you may prefer to move further forward. Also, please note that neither of these cabins have staterooms above them, so noise could be an issue from that direction as well. There are 18 Balcony Staterooms on Spa Deck of the Carnival Glory.